The rise of creepy clowns has been fueled by a combination of popular culture and psychological theory. One of the earliest popular clown scares happened in the 1980s, when people dressed as clowns lured people into the woods and terrorized the public in the Boston area. 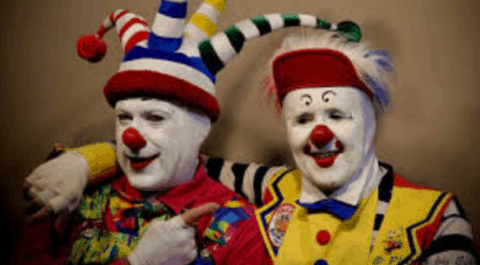 A cryptozoologist named Loren Coleman came up with the “Phantom Clown Theory,” which claimed that mass hysteria was the root of all of these clown attacks. Since then, events like the release of the movie “It” and other pop culture phenomena have prompted similar events throughout the world. Studies have shown that even newborn babies are turned off by images of clowns in hospital nurseries. The exact reason, however, why we find clowns creepy remains very broad and unsure. Some theorize that creepiness is caused by a sense of ambiguity, which could be caused by the fake persona and heavy makeup that clowns tend to have. Others claim that the major components of creepiness are a different unusual physical behaviors that combine to form a sense of unease. Whatever the cause, everyone can concur that the vast majority of the public find clowns creepy, not cute. Psychology of Creepy Clowns by Skye is licensed under a Creative Commons Attribution-ShareAlike 4.0 International License. I think this is a really interesting topic. I feel that people always have a fear of the unknown. This idea pertaining to clowns can give our minds more freedom to create more terror amongst us. I look forward to reading more into this topic. I want to learn more about why clowns are, in fact, terrifying.